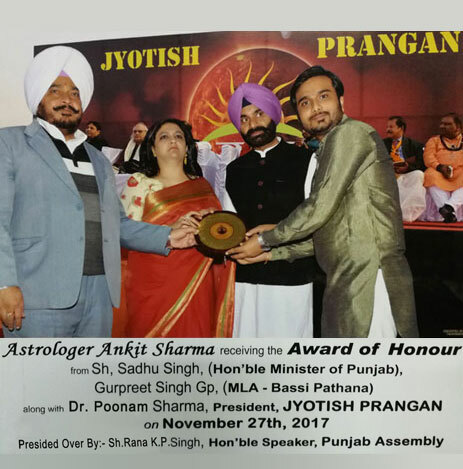 Recently in Chandigarh, where the head office of his worldwide famous service firm is well-based, world-famous and grand astrologer Ankit Sharma won another gratifying accolade in form of Jyotish Prangan's Award of Honour on November 27, 2017. This prestigious award of honor will certainly enrich his affluent treasure of various awards and recognitions won by him from time to time during his fast-paced and very successful career in Vedic astrology. This jyotish prangan's award of honour was granted to him by Shri Sadhu Singh, Hon'ble Minister of Punjab, during a highly constructive, inspiring, and laudable event titled as 'Astrology and Astrologer Seminar' in Chandigarh, in gracious presence of Shri Gurpreet Singh (MLA - Bassi Pathana), and Dr. Poonam Sharma (President, Jyotish Prangan). The event was held at the Exhibition Ground, Sector-34, to propagate the relevance, great importance, and copious benefits of Vedic astrology in today's hectic and stressed life. The grand organizer of this motivational and benevolent seminar was Jyotish Prangan, a well-eminent organization well-based in Panchkula (Haryana), which has been working remarkably for the regeneration and betterment of Vedic astrology. Jyotish Prangan holds the great credit and privilege of having organized many such astrological events from time to time of regional, national, and international importance. And, his ever-growing number of satisfied and happy clients located in India and nations worldwide. All major and most influential spheres of life have been served very successfully through his top-notch and globally-acclaimed astrological solutions. Again, almost all problems and adversities occurring ever in each of these life's spheres, have been solved, mitigated, or eradicated by him. These facts render his as one of the most competent, reliable, and top astrologers in India and countries across the globe. However, astrologer Ankit Sharma has been most popular and highly sought after for tackling problems and disputes relating to the following spheres of life ----- businesses and professions; husband-wife relationship; career selection, career struggles, and fame in career; love and romance; love marriage, arranged marriage, and inter-caste marriage; new business ventures and investments; well-being and health ailments; politics; foreign tours & travels; money & finances; domesticity and family; and Kundli and horoscope related services.